This is the most wonderful thing I’ve heard in a long, long time. Thanks for posting. I’m going to link to it. Wow! Amazing! I’m linking to it too! I’m glad you like it! I found out they existed some time ago now, and it was finding their vocations leaflet at the beginning of the month that got me round to writing about them. Apparently there’s another community in France that accepts girls with mental disabilties. Berenike, thank you for letting us know about this! It’s so encouraging that there are such beautiful examples of God’s grace in this fallen world. Beautiful. Thank you so much for sharing this. I have an aunt who is mentally retarded. I thought of her as I read your post and was moved to tears. No idea, sorry. But speaking as someone with no idea – communities might be a bit unsure about what they would be taking on, not knowing you personally. It might be an idea to find a community that you like that has oblates, for example. You could go and visit, see if you still like them, and talk to whoever is in charge of the oblates about becoming one. You get to know them, they get to know you, etc. But again, I have no idea. Maybe Fr PF is reading this, he might know more, maybe Cordatus knows something. Anyone? Ever since my daughter, Mary Evelyn, was born with Down Syndrome almost 5 years ago I’ve thought about what it means to be last in this world and first in the next and how her loving spirit is such a gift to us spiritually as well as emotionally and physically. I’ve wondered if there was a place for her and others like her to dedicate themselves to God. People with DS are by nature filled with the love of God and ready to share it with everyone. How beautiful they are and how lovely to hear of this community of women, both with and without DS, sharing God’s love with each other and the world. This is the most beautiful thing I have read in a long, long time. I think this is amazing and so very special i have a son 11 with Down Syndrome and wish there was something like this for him. He truly is such a gift of god, he gets it, simplicity and pure love which this world is in such desperate need of. This is quite wonderful. As Down Syndrome children now attend college, hold jobs, & live into their 60s, a religious community for them is especially valuable. A foundation of this order in the United States is desirable. Any possibility? What power their child-like faith and prayers will be for our lost world, mired in the culture of death. Thanks be to God that they are here for us. This all seems a bit odd. Why is there no link to an official web site? If this was true, it would have garnered allot more publicity than just a wordpress blog. There is an order of nuns with the same name but located in Kansas that ministers to women in college. I am sorry to be such a doubter, but something seems very fishy here. If Im wrong, my sincerest apologies along with 12 Hail Mary’s and 4 Our Father’s. It’s too bad that there are persons who have to doubt stories such as this one. We have this problem in our country that we want to approach religion or spirituality by intellectual means only. GODS WAYS ARE NOT OUR WAYS! Faith doesnot need analytical brain work as Christians WE WALK BY FAITH AND NOT BY SIGHT! This was a beautiful story – too bad some people can’t delve into the beauty hidden in circumstances outside those we are used to on a daily basis. Please do say your 12 Hail Mary’s and 4 Our Fathers. I would suggest you also add 20 Acts of Contrition. As for not having a website – God has no need of advertising. God speaks to the heart not to eyes. P.S. I notice the name “politicaljules.” Being politically correct isn’t always where it’s at. PJ expressed an honest doubt. I replied to her on her blog. You’ve just been aggressively rude, and most of your remarks are without any ground in PJ’s comment. Wow. I sure hope this is for REAL. This really made my day. This is a wonderful story… thanks for sharing. Do you have a website for this congregation? I’d like to learn more about them. Thank you and God bless you! 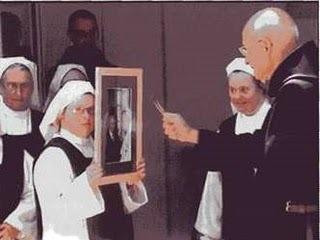 Does anyone have contact information: mailing address, e-mail and/or website, person to contact for the Little Sisters Disciple of the Lamb and the Franciscan’s men’s community? Thaks a lot, Genial, for providing this information! The author of this blog post, Berenike, is on a Lenten blog fast, and I myself aleady wondered how to answer the enquiries. I also think it is not marvellous that the community has no website. I knowmore than one thriving femal monastery myself on whom very little an be found on the internet. How absolutely wonderful!Thanks for this post. That there is a community for young women with Downs means that they too, can be called to the Religious life-something which I hadn’t previously thought could happen. Our 11 year old daughter has Downs-wow wouldn’t it be fantastic if she was called to the religious life! You made the big time today – a mention on Gloria TV! Not to be negative, but the tragic thing is that 90-95% of all Down Syndrome babies are aborted before they ever see the light of day! That’s why I fear that the order will collapse in the next generation, unless non-Down Syndrome nuns continue it. I pray for the victory of the Culture of Life, so these beautiful jewels of God’s creation, whom the world arrogantly calls “imperfect” and “defective”, will continue to populate this wonderful order! Please keep my wife and I in your daily prayers for God;s Mercy and Peace in our broken hearts,health and shattered lives!! Please keep us in prayer for the long term?? Oct,Nov..Christmas 2010,2011…?? Thank you. Bill and Carol. oh.usa. This blog has nothing to do with the community – I just found one of their leaflets when in France a year ago – but I will write out your request and post it to them. This is wonderful, and as a former Special Education have a special place in my heart for such folks. I have learned a lot spiritually from folks with DS, as well as disabilities in general. While this is wonderful, I am curious about the acceptance of those with a call who have other disabilites and if others have knowledge of them. I am thinking specifically of mental illness and bipolar. I have a daughter who has DS ….. From an early age she was spiritually wise and on several occasions was able to share certain spiritual experiences…simple yet profound are the messages she has shared ! In her simplicity and purity of heart my daughter is truly a living and loving vessel of Gods love. Her presence so often reminds me to live a life that is genuine…to live fully and to appreciate the present moment. 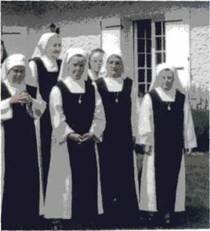 I had heard that there was religious order in France who welcomed young women with D.S. and for years I have been trying to find out the name of the order…now I have it ! May the Holy Spirit burn in the hearts of others throughout the world so that this most beautiful order of women become known. 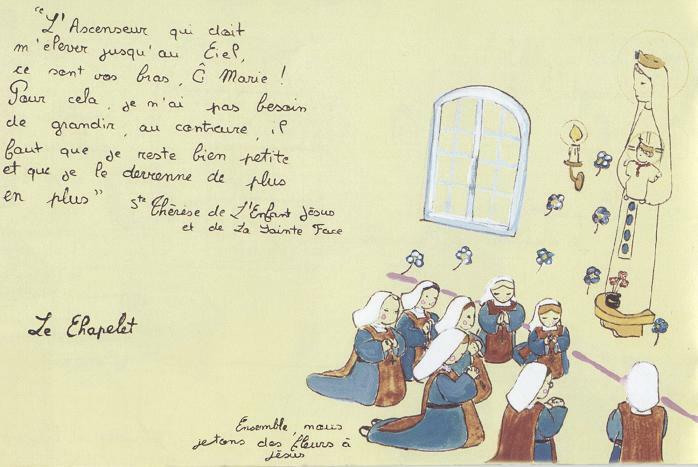 May the “little sisters ” in France , be an example for other Orders throughout the world , for when DS women enter religious life, their very presence becomes a living and breathing gospel message ! May i humbly request you to please pray for my brother, Carlos, who until now, has remained unconscious four months after his brain operation due to aneurism. Please pray for his healing and recovery. Thank you so much sisters and please be assured that i will include your intentions in the Masses that i will celebrate. God bless your community! Would they take young women with autism, like my own daughter? The number of people with autism continues to rise exponentially even as the number of people with Down Syndrome decreases so there might be a very big pool of potential vocations there. Thank you for standing with us in daily prayers(2013,14,,? )for God’s Mercy & Peace!Despite pain and ongoing sorrows we continue to stay at our Post in Hope and Prayer! Moving Forward! Please continue to pray with us daily(2013) for God’s Mercy & Peace in all areas of our Lives!Especially our Broken Hearts! Also prayer for relief from severe financial misery which is making recovery so much harder! Pass Prayer Request on to other Communities(Women&Men) of Prayer that you know of in the Worldwide Community of Prayer? Urgent! PS. We will continue to keep you in our daily prayers as we cry out to God Day & Night for His Mercy & Peace Now & in the Days ahead? the death of our only son and Other ongoing Sorrows in our Lives! Never the less, We continue to stay at our Post in Hope and Prayer with the help of your daily prayers & God’s Mercy! Communities(Women&Men)of prayer that you know of in the World? Meanwhile,We continue to stay at Our Post in Hope and Prayer and keep moving forward despite pain and ongoing sorrows! PS. We will continue to keep you in our daily prayers as we cry out to God Day & Night for His Mercy & Peace! Today is my wife’s Birithday and the Day We lost our Only Son a few years ago!Despite the aftershocks of the loss and the days this tragedy(All other Sorrows with it..Financial,Health,Loss of Entire Families,Friends etc) happened we continue to move forward into God’s Arms( The Holy Silence) of Eternal Rest! Leaving all the WHYS?? in His Hands! On this side of Eternity we just don’t understand??? But we will continue to move FORWARD INTO HIS ARMS! ONLY HIS WILL MATTERS NOW?? Just continue to pray with us daily(2013,2014..?? )for God’s Peace and Recovery! Feel free to pass Urgent Prayer Request on to othe Communities(Women&Men)of Prayer that you know of in the Worldwide Community of Prayer? PS. We will continue to include you in our daily prayers as the pain and sorrows in our hearts cries out to God Day & Night for His Mercy & Peace Now and in the Days ahead..August,Sept,Oct,Nov..Christmas 2013,2014…?? Slow Recovery from the Death of Our Only Son & Other (Relief From Severe Financial Misery,Health Issues,Loss of Families,Friends,Deaths etc) Other Sorrows.. Thank you for praying with us daily(2013,2014.? )for God’s Peace & Recovery! Recovery is very slow!Please continue to pray with us daily! Desptie it all we continue to stay at our Post in Hope & Prayer with the help of your daily prayers and God’s Mercy! Feel free to pass Urgent Prayer Request on to other Communities(Women&Men)of Prayer that you know of in the Worldwide Community of Prayer? PS. We will keep you in our daily prayers as we cry out to God Day & Night for His Mercy & Peace! Especially in these dark and uncertain times!There is great potential for real trouble between now and Christmas?? God only knows? Please pray for Peace! !Pass on to others to pray! Please pray for our unspoken request. Thanks for praying for us. We wish all the Community a Peaceful and Hope filled New Year! Thank you for praying with us daily for God’s Mercy & Peace! Our Broken & Exhausted Hearts Continue to Cry out to God Day & Night for His Mercy & Peace Now & in the Days ahead..2014..? Slow Recovery from the Death of Our Only Son & Other(Relief from severe financial misery,health issues,losses and deaths..)Sorrows… Recovery is very slow! Please continue to pray with us daily for God’s Healing & Protecting Peace through out 2014 or as long as possible? Please pass on to Nuns,Sisters, prayer groups,prayer chains and other Communities of Prayer that you know of in the Worldwide Community of Prayer? URGENT! Meanwhile,We continue to stay at our Post in Prayer and Hope despite all the pain and sorrows! PS. We will continue to keep you in our daily prayers as our Broken Hearts Continue to Cry out to God Day & Night for His Mercy & Peace Now in the Days ahead until we enter His Eternal Rest!In my hearts and of hearts I am feeling dread and heaviness about 2014? PRAY FOR PEACE! Please pray for the healing and restoration of my marriage. That my husband’s heart be touched by God to be open to reconciliation. That I will know wisdom and grace at this time. Normally I don’t read article on blogs, however I wish to say that this write-up very compelled me to take a look at and do so! Check out the website sistersofthefiat.org. Thank you for praying and your enduring patience! Thank you for praying with us daily in the recovery process for God’s Peace! Please continue to pray with us(Oct,Nov..Christmas 2014,2015..? ))daily for God’s Healing & Protecting Peace in our broken hearts and lives. Please also pray for relief severe financial misery which is making recovery next to impossible! Can you pass Urgent Prayer Request on:Nuns,Sisters,Prayer Groups,Prayer Chains,Parishes,Churches & Others? Meanwhile,We stay at our Post in Prayer and Hope with the help of your daily prayers as we struggle to do God’s Will & enter His Rest! Thank you for your enduring patience! PS. We continue to keep you in our daily prayers for God’s Peace as our Broken Hearts Cries out to God for His Mercy & Peace Now and in the Days ahead?? This sounds very interesting. The innocence of persons with Downs Syndrome is a great blessing for the Church, and they must be among the favorite disciples of Jesus. I hope that Jerome Lejeune will be canonized as a saint. But I wonder about the demands of canon law, as well as the great vulnerability of these little ones. What is the level of understanding that is required before the Church allows a person to pronounce life-long vows in a religious community? How is it determined that the candidate has sufficient use of reason either to enter into marriage, or to surrender permanently the right to marry? Interesting question. But I have seen so many “normal” religious abandon their vows, even after many years, that I am not inclined to worry about these girls with Downs. It must take unusual determination to find and join this order in the first place! I am sure the Church authorities involved have addressed the questions of capacity.